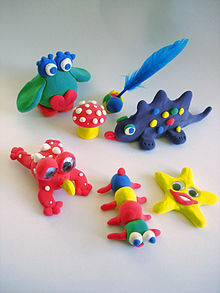 The non-toxic, non-staining, reusable modeling compound that came to be known as “Play-Doh” was originally a pliable, putty-like substance concocted by a Cincinnati-based soap manufacturer; it was developed to be a product that could clean coal residue from wallpaper. Following World War II, with the transition from coal-based home heating to natural gas and the resulting decrease in internal soot, and the introduction of washable vinyl-based wallpaper, the market for wallpaper cleaning putty decreased substantially. The man joined the company with the remit to save the company from bankruptcy; he subsequently discovered that the wallpaper cleaner was being used by nursery school children to make Christmas ornaments. So he took Play-Doh to an educational convention for manufacturers of school supplies, and a department store in Washington, DC began selling the compound. The product became a huge success among children. In 2003, the Toy Industry Association placed Play-Doh into its “Century of Toys List”, a roll call of the 100 most memorable and most creative toys of the twentieth century. Sometimes you only need an one detail change to make it right.